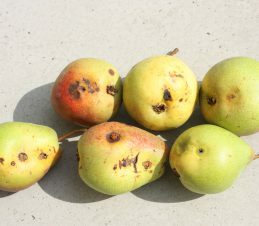 The codling moth is a common pest that will make your apples “wormy” or “maggoty.” If codling moth is not managed in backyard trees, as much as 90% of the fruit can be “wormy” and unfit to eat. 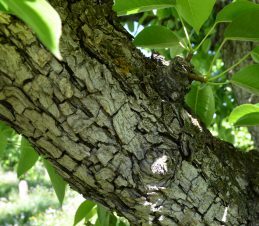 All property owners with apple, pear, crabapple, or quince trees (host trees) are legally responsible for controlling the codling moth on their property in the Okanagan, Similkameen and Shuswap Valleys. Codling moths from your backyard can spread to neighbouring orchards, jeopardizing your neighbours livelihood and increasing the amount of pesticides used in your area. The SIR program is in place to decrease the overall regional pesticide use against the codling moth and protect the agricultural community. Managing your trees for codling moth requires multiple applications of pesticides and/or labour-intensive pest management care. 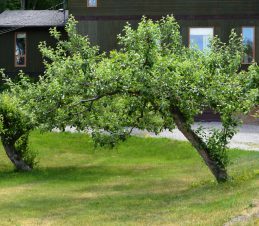 Apple and pear tree owners should carefully consider the costs and benefits of growing backyard trees. Host trees that will not get adequate care should be removed. An alternative for home owners who wish to avoid the codling moth pest is to plant plum, peach or apricot trees instead of apple or pear trees. These trees in general have fewer fruit damaging pests. All infested fruit should be sent to the landfill or placed in a bucket of water for several days to drown the larvae. Do not compost infested fruit. Composting fruit allows moth larvae to continue their life cycle. Note: If eating wormy fruit, be sure to cut out damaged portions, because they might contain toxins (aflatoxin) generated by mold. Wood from host trees that are removed should be burned, chipped or sent to the landfill. Moths spin cocoons under the bark and if wood is sold or moved to another location, the moth moves with it and can infest a new area. If you wish to keep the wood for personal use, you can tightly tarp it. Codling moths can hibernate for up to two years, so infested woodpiles should be tarped for at least two years.